Grading employees can be a bit of a stressful event. Making sure you properly evaluate the talents of an employee is important for everyone in the company from top to bottom. If you’re looking to streamline this process in your office or workplace, an employee performance review form could be exactly what you need. The template is very easy to use and simple to understand. It can also save you valuable time and money, as the employee performance review template can be downloaded instantly and it’s absolutely free. 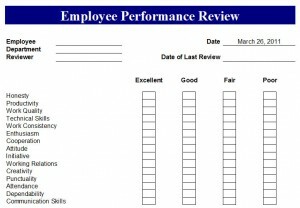 The employee performance review template is designed to structure the employee evaluation process. The template does not have any formulas, so it can be used effectively either on paper or in the template itself. The top of the performance review template is reserved for marking the name of the employee, the employee’s department, the name of the reviewer, today’s date and the date of the last time the employee was reviewed. As designed, an employee can be graded in four ways: “Excellent,” “Good,” “Fair,” or “Poor.” Next to the corresponding category you will simply check the corresponding box to grade the employee’s performance. Beneath the 15 categories is a section marked for “Other.” Here, you can mark down things that are centrally important to your office, work environment or employee requirements. The bottom of the employee review template has spaced reserved for specific comments, the signature of the employee and the signature of the reviewer. This template is printable, so sheets can be filled out and filed away if you so desire. The employee performance review form is also completely customizable, so you categories could be added or removed depending on your needs. The color scheme can also be changed to match the scheme of your company. You can also add your company logo to further add a personal touch.